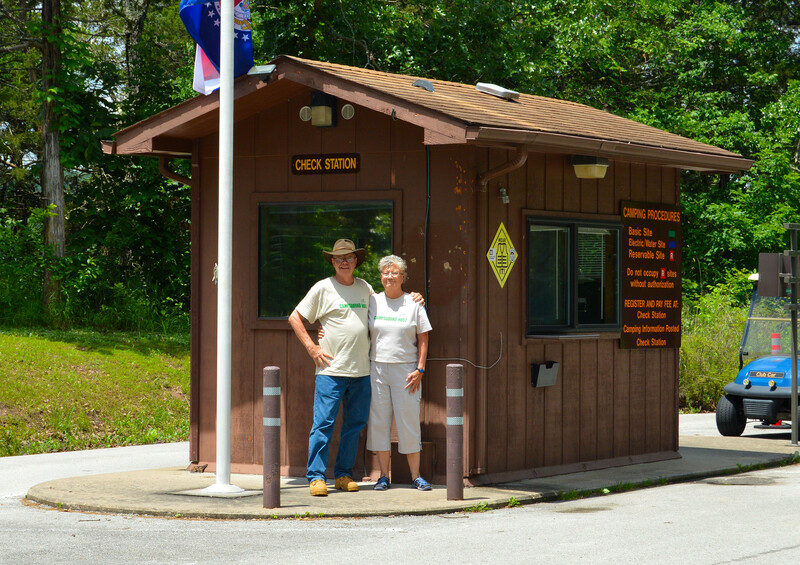 We spent a week at Viney Creek Campground helping to open the park for Memorial Day week-end. It is a small but beautiful peninsula on Table Rock Lake. It is a beloved place for the locals. They launch their boats for fishing and water recreations, they camp at the lovely treed campsites, and the day users are avid swimmers and picnickers. We fell in love with the park as campers. It was a busy place despite the rainy week-end and we were fortunate enough to have great support from the Roaring River State Park employees and staff. This campground is a busy place to camp host and without support, it would have been difficult. The host site is perched aside a boat launch slanting at an angle before it levels off to rest. It was a challenge, but with the assistance of another host from Roaring River, Phil was able to slip the rig into place without any severe consequences. Viney Creek was once a park managed by the Corps of Engineers, but because of lack of use and reduced funding, it has been turned over to the State Park System. The park is not well known and that’s too bad. It is the least used park in the Missouri State Park system, and is not holding it own financially. Those that love and use the park are hoping that it will not be closed down in the future.